Continuing on NM 76 towards the village of Las Trampas, enjoy a spectacular vista as the valley opens before you, the Truchas Peaks rising on the eastern horizon. Las Trampas or Trampas is a small, unincorporated town in Taos County. 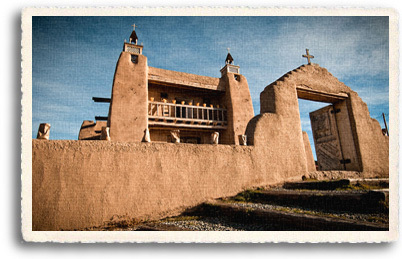 Founded in 1751 by a Spanish land grant entitled Santo Tomás Apostol del Río de las Trampas, (Saint Thomas, Apostle of the River of Traps), the village was settled by 12 families from Santa Fe, led by seventy-four-year-old Juan de Arguello. Located in the valley between Truchas and Picurís, Las Trampas is approximately halfway between Taos and Santa Fe on what is now the High Road to Taos. As with other communities established at that time, the village was built around a plaza. When the village came under attack, the entrances to the plaza could be blocked to create a fortress. And the village did survive numerous attacks as well as a smallpox epidemic. The church of San Jose de Gracia at Las Trampas is one the finest examples of the parish church still existing, with outstanding reredos, or altar screens, painted by well-known santeros. Parish churches were a more elaborate structure based on the original mission churches which were established by the Spanish in New Mexico. The mission churches were simple rectangular structures of adobe bricks with flat wood beam ceilings. They were fashioned after the fortified churches of Mexico with tall, bright, white-washed interiors. Constructed of the same materials, the parish churches evolved into a cross-shaped plan like the great cathedrals of Mexico and Spain. To the exterior of the mission church were added one or two simple bell towers. Built between 1760 and 1776, local legend says the church actually dates from a much earlier time when twelve devout men built a church of the twelve apostles during the twelve year period from 1580 to 1592. Isolated and small, Las Trampas was never large enough to have a resident priest, so the faithful of the village were served by the Franciscans at the Picurís Pueblo, several miles up the road from Trampas. The village was also served, as was the case in many rural areas, by the Penitentes. The Penitentes was a religious fraternity dedicated to providing religious and social services for the communities. San Jose de Gracia is an adobe parish church with the traditional cross-shaped plan and an atrio, or courtyard which serves as a cemetery. A low adobe wall enclosing the atrio steps up to create a portal, or entry into the church. The entrance is flanked by two bell towers. The rough wood plank floor, the wood beams and ceiling, the mismatched pews, the works of art created by the local santero artisans, and the natural light all work together to create an interior that is natural, rustic, and humble and reflects the simple, honest faith of the people. San Jose de Gracia faced a major threat in 1966 in the form of the New Mexico State Highway Department's plan to widen the road through the village. The plan would have damaged the cemetery and brought the new road to within ten feet of the church itself. Through dedicated efforts, preservationists were able to save the church in its intact form. The historical significance of the church was also documented, and it was granted National Historical Landmark status in 1967, which made damaging the church a federal offense. In June 1967, a compromise between preservationists and advocates of the road was reached which insured the safety of San José de Gracia. In addition, the church was repaired and restored with a new coat of adobe plaster and new wood steeples. Thanks to the preservationists, the church stands today as one of the best examples of the New Mexico parish churches of the 1700s. Travelers coming from the direction of Santa Fe on the High Road to Taos first see San Jose De Gracia as they round a bend in the mountain road and descend into the village. The church sits peacefully in the middle of the village as it has for centuries. If the doors to the church are open, visitors are welcome to enter the church and view the works of art by local artisans which adorn the interior of the church. 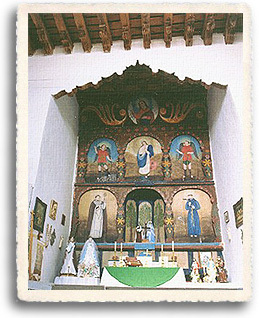 Pictured bottom right: The church altar of San Jose de Gracia at Las Trampas is surrounded by retablos and santos by local santeros.